Photos from Palestine from the late 1800s an early 1900s are a joy to view, because the methods of the people, dress, and vistas were largely unchanged from the days Jesus walked. It was only in the 1930s and 40s that development began in earnest and especially after Israel became a nation again in 1948 that things began to modernize and the old ways were vanishing. In the 1800s, as travel became easier with trains and modern steam ships, many upper class men and women in Britain or America took a Grand Tour of Europe. Interest grew and soon many expeditions to Palestine took place. The Ottoman lands were such a curiosity that a plethora of Travelogues to the Middle East burgeoned in the 1700s to early 1900s. 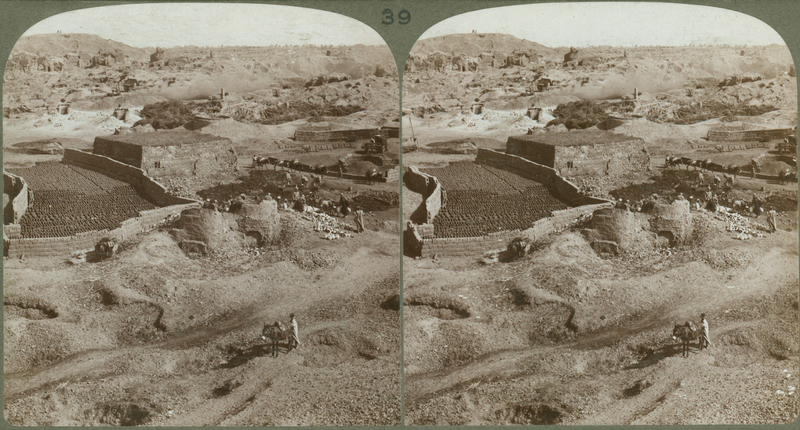 One such travelogue book in my Logos Software is Earthly Footsteps of the Man of Galilee, and another is the one I've quoted below, Egypt Through the Stereoscope. The stereoscope is "a device for viewing a stereoscopic pair of separate images, depicting left-eye and right-eye views of the same scene, as a single three-dimensional image." That's why the image below is a double image. I'm going through Dr Abner Chou of The Master's Seminary lectures on Exodus. (Note- that link will expire on July 31, 2018, as Wikispaces is closing and hosted lectures will go away unless you download them prior). I find it interesting to see what it might have looked like and enjoyed this view from a hill above an Egyptian brick-making operation taken from a Travelogue Expedition in the early 1900s written by Dr James Breasted. The book is available today and is considered culturally important. ‎Just north of the chief ancient city of the Fayum, we stand looking nearly eastward over the ruins of Crocodilopolis. Behind us stretches the Fayum, rising at last to the vast waste of the Sahara, spreading out to the far Atlantic. Beyond the trees that mark the sky-line before us the Nile is twenty-five miles away. ‎We see here modern natives engaged in brick-making by the same methods that were employed five thousand years ago. The soft mud is being fixed under the feet of a fellah, while another at a table molds it into bricks. These are taken while still in the molds and carried to the yard by a third native who gently detaches them from the molds and leaves them to dry in long rows.… In spite of the lack of firing they make a very desirable wall; in a practically rainless climate they stand well.